Just when Florida needs a lifeline in the struggle with sea-level rise, President Donald Trump tosses us an anchor. 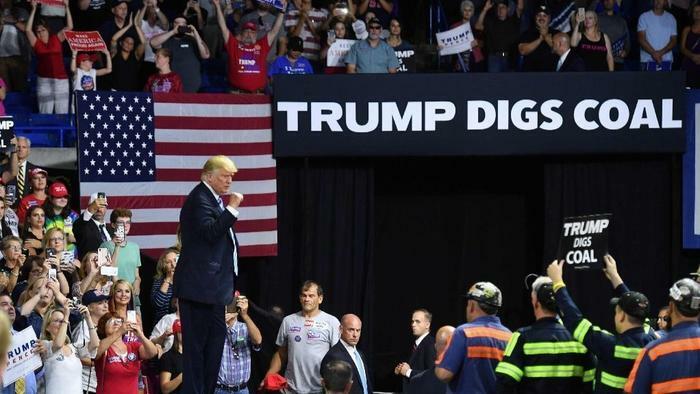 Trump on Aug. 21 called for cutting air pollution regulations in a move expected to worsen emissions fueling the climate change threatening to swamp Florida. To prop up and prolong the life of pollution-belching, coal-fired power plants, Trump seeks to strike down more Obama-era efforts to combat climate change. To help the coal industry keep chugging along, Trump is willing to risk more of the pollution that worsens Florida’s sea-level rise problem. And just when Florida needs a sea-level rise champion in the governor’s mansion – able to rally federal and state action to face the invading sea – Trump is backing a gubernatorial candidate who doesn’t think facing climate change is part of the job description. Ron DeSantis in August said while he supports better flood control to face sea-level rise, he doesn’t think it’s the state’s job to deal with climate change. And he questions whether man-made pollution is really the problem. “I certainly don’t think in Tallahassee, you know, we’re going to be able at the state level to do things that are really global in nature so that’s something that I think is more of a national and international issue,” DeSantis said, according to the Sarasota Herald Tribune. But the problem is that Trump’s argument for gutting the federal power plant emissions standards is that the states should be determining their own climate change efforts. That doesn’t sound like something that interests the candidate Trump is trying to send to Tallahassee. DeSantis’s what-can-I-do-about-it stance on climate change makes you wonder whether he realizes he’s running to be governor of a peninsula – one that is already dealing with threats from rising seas. More likely, DeSantis – like Trump – is just playing to his base of supporters at the expense of Florida’s future. DeSantis and his political benefactor are betting that they can reap the political benefits of ignoring action on climate change before facing the consequences of inaction. But Floridians can’t afford that kind of disregard for science and for the future of the place we call home. The worsening dangers of sea-level rise are already making themselves known with sunny-day flooding, from Miami Beach to Delray Beach, during king tides. And from prolonged inland flooding, from Sunrise to Loxahatchee, occurring after drenching storms more frequently overwhelm our overmatched drainage systems. Also, South Florida’s sea-level rise threat remains, even when flood waters subside. Rising seas exacerbate the underground influx of saltwater pushing into and fouling our main drinking water supplies. Trump weakening power plant emissions standards and prolonging our use of fossil fuels makes Florida’s sea-level rise problems worse. Continuing to pump elevated levels of carbon dioxide and other polluting greenhouse gases into the atmosphere traps the sun’s heat. That boosts sea levels by melting ice sheets and also because the oceans expand when they get warmer. Already, South Florida faces a two-foot sea level rise by 2060, according to estimates from the Southeast Florida Regional Climate Change Compact. South Florida water managers warn that without serious upgrades to pumps, canals and levees, the aging flood-control system that keeps us dry won’t work with a two-foot sea-level rise. While South Florida communities, coordinated by the compact, are teaming up to become more resilient to sea-level rise, our current governor and the Legislature continue to balk at taking real action. Worse than that, our president is taking steps that make our climate-change situation worse. Obama’s regulations aimed to cut carbon dioxide emissions from power plants 32 percent by 2030. Trump’s version is only estimated to cut emissions up to 1.5 percent, the Associated Press reported. And if the long-term sea-level rise consequences of Trump’s plan aren’t scary enough, consider the dangerous health effects on people breathing the air Trump would make easier to pollute. The Associated Press reported that Environmental Protection Agency models estimate that between 300 and 1,500 more people could die prematurely each year by 2030, compared to the Obama plan. There’s also an expected spike in major asthma attacks and heart attacks due to allowing more emissions than the Obama plan. Trump’s indifference about air pollution and its implications for sea-level rise shouldn’t surprise us. After all, before trying to roll back federal emissions rules, Trump was pushing to weaken water pollution regulations. You would think the toxic algae outbreaks once again covering Florida’s waterways would be a wakeup call for a president who spends so much time at his oceanfront Winter White House in Palm Beach. Likewise, the red tide invasion – killing fish, manatees and dolphins and scaring tourists away from our beaches – should be a reason for more requirements to clean up the pollution we drain into the sea. Florida and other states can’t solve these large-scale pollution problems by themselves. Our nation’s air and waters aren’t constrained by state boundaries. There should be high national standards and a commitment of federal action to ensure clean air and clean water – not a sliding scale of what’s acceptable and what isn’t, determined state to state. Before Trump took office, legal fights with the power industry and coal-friendly states succeeded in stalling implementation of Obama’s plan. Now Trump’s proposed rules are expected to lead to a barrage of legal challenges from the other side, with the matter likely to be decided by the Supreme Court. But President Trump’s actions make it clear he’s willing to trade Florida’s future for coal country votes. If Ron DeSantis really wants to be our governor, he should show Floridians he’s not willing to make that bargain. Floridians in November need to make sure they pick a governor willing to face the sea-level rise crisis and its causes – not someone pretending they don’t exist.